When Peter was in the temple not long after Pentecost, he encountered a lame man and healed him in the name of Jesus. 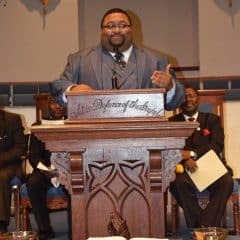 The man’s healing caused quite a stir in the community, but it pointed many people to Jesus and demonstrated that Jesus’ power was now working through His disciples. 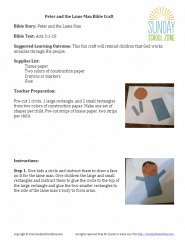 This fun craft will remind children that God works miracles through His people. 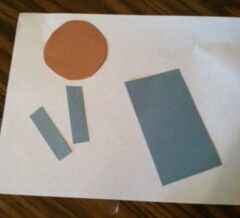 Teacher Preparation: Pre-cut 1 circle, 1 large rectangle, and 2 small rectangles from two colors of construction paper. Make one set of shapes per child. Pre-cut strips of tissue paper, two strips per child. Step 1. Give kids a circle and instruct them to draw a face on it for the lame man. 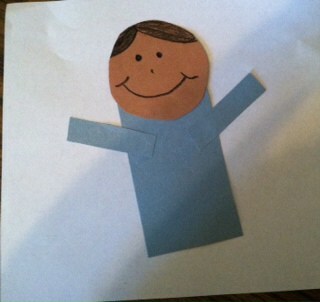 Give children the large and small rectangles and instruct them to glue the circle to the top of the large rectangle and glue the two smaller rectangles to the side of the lame man’s body to form arms. Step 2. Guide children in accordion folding their strips of tissue paper to become “leaping legs” for the lame man. 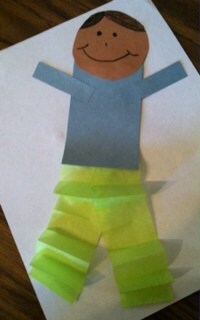 Have kids glue the “leaping legs” to the bottom of the large rectangle. 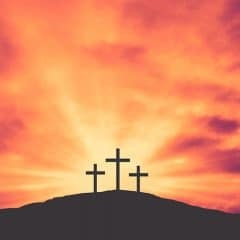 Now their lame man has been healed and can jump and leap and praise the Lord!